This is an easy fun foam craft or Halloween craft project for children! 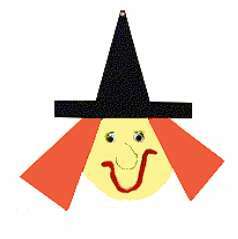 We include a witch face pattern for you to print and trace. Start by clicking on the pattern and printing it out. Trace onto fun foam and cut out. Place the hair on top of the face, on the sides then glue the hat triangle on top of the hair and face. Lastly glue the brim on top of the triangle hat. Use a paper punch to pop a hole in the top of the triangle hat. Add the two goggle eyes. Twist a pipe cleaner into a mouth shape and, with green marker, draw a funny big nose. Add some string in the hole and tie a knot and hang your witch in the window with a suction hanger.